As the fight against Boko Haram continues, discussions of the how to approach post-conflict reintegration are becoming increasingly important. There are currently two possible approaches to the Boko Haram conflict. Most Nigerians who have commented on the issue favor a solely military solution, which the Nigerian government has put at the top of its agenda. Despite its appeal, this solution has increased the desperation of Boko Haram. The group has lost some of the territory it controlled, but it has also moved from just holding territory to carrying out isolated cases of suicide bombings in metropolitan areas in the northeast. The group has also transformed itself into Wilayat Gharb Afriqiya’ (Islamic State of West Africa) and recently launched an attack on Chad. 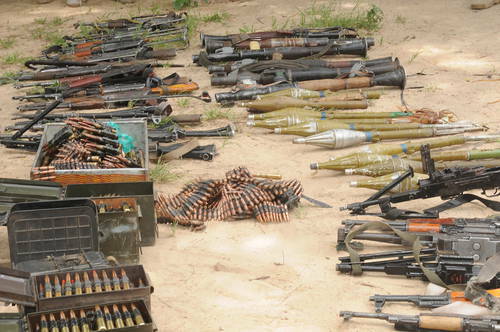 This shows that Boko Haram seems to be adapting to the changing dynamics of Nigeria’s military solution. A second option, which has been suggested by stakeholders in the north, is based on the state-led peace process that was used to address armed militants in the Niger Delta in 2009. Its proponents claim that marginalization and unjust distribution of resources by the Nigerian state account for the emergence of Boko Haram—issues similar to those raised by the Niger Delta fighters during their insurgency— and argue that Boko Haram fighters should be given the same treatment as those in the Niger Delta. In the case of the latter, the federal government applied an amnesty policy to pardon members of militant groups. This was followed by a post-amnesty disarmament, demobilization, and reintegration (DDR) program that included a 5-year reintegration plan with vocational and formal education training opportunities for ex-militants, as well as a monthly stipend of about $400. However, people’s perceptions of the Niger Delta DDR program are largely negative, due to the fact that they are primarily based on the affluent lifestyle attained by some ex-militant leaders, and emphasized in the media. In addition to the regular DDR benefits, the government engaged some ex-militant leaders to provide security for oil industry infrastructure in the Niger Delta, and oil companies in the region allowed them to earn additional money as contractors. Some of these ex-warlords also gained political influence after participating in the amnesty program, as an outcome of their role in the political process in the Niger Delta. This perceived affluence and political influence has strengthened popular opposition to the idea of amnesty and DDR for Boko Haram. The success of some former leaders is not representative of all ex-militants. My research on the subject shows that unlike the wealthy ex-warlords, many foot soldiers continue to live in poverty in local communities of the Niger Delta. Yet there are better reasons why we should not apply a Niger Delta-style solution to Boko Haram. Boko Haram and the militant groups in the Niger Delta are two similar but completely distinct types of violent groups. Applying the same policy solution to both would be to neglect the complexities that set them apart. The two groups are similar in that they both emerged in large swaths of Nigerian territory with little or no government presence. The populations living in the creeks of the Niger Delta and those in the fringes of the northeast are among the poorest in Nigeria. However, the evolution and character of Boko Haram and the Niger Delta militants reveal their distinctions. In the Niger Delta, popular mass movement against the federal government of Nigeria, and intra-communal and inter-ethnic violence laid the foundation for the formation of rebel groups. In my own work, I’ve observed that as their militancy progressed, some rebel groups started recruiting the youth with a promise of monetary compensation. In contrast, rebel groups in the Niger Delta did not forcefully conscript youth or engage in indiscriminate attacks on communities. In the case of Boko Haram, Islamist religious ideology laid the foundation for recruitment. The indiscriminate use of violence by the Nigerian armed forces also pushed people further into the hands of the terrorists. In the beginning, Boko Haram targeted mostly government institutions that they claim represent the western values that they see as responsible for corruption and injustice. But as the group evolved, it targeted civilians, kidnapped women and children, forcefully conscripted young men into its fighting force, and burned down communities. These acts of violence against the general population reduced the civilian support base of Boko Haram. These differences between Boko Haram and the Niger Delta militants indicate that the government should also shape different state responses to the conflicts. Treating Boko Haram members in the same way that Niger Delta militants were treated—that is, pardoning them and providing them with stipends—would be unjust to the communities they have impacted. Many victims will view it as a reward for bad behavior and it will raise questions of justice in the peace building process. Also, a monetized DDR will not attract members of Boko Haram who have been deeply influenced by the Islamist ideology that was carefully constructed to indoctrinate them into a culture of violence. The Nigerian government must offer communities and fighting groups in the northeast a genuine democratic alternative to violence. But instead of following an old model, it should propose a peace building process that includes a context-specific DDR program. This program should be developed in consultation with the civil society (religious leaders and Islamic scholars, women’s groups, traditional rulers, youth groups, and local politicians) in places impacted by Boko Haram. Such a model should include communities in the peace building process, an aspect that has been missing in all state-led peace building efforts in Nigeria. The government should also work with communities to understand the character and structure of the non-state armed groups in the northeast. A well-informed mapping of non-state armed groups in the northeast should guide the DDR program for the region. In addition, the government should work with communities to facilitate a transitional justice program. Peace building within the context of internecine violent conflicts is complex and riddled with dilemmas. Popular opinion in such conflicts is shaped by several factors, but it is the responsibility of the government to find long-lasting solutions. In the northeast of Nigeria, it is time the government provides a non-military alternative to the armed groups, including Boko Haram, in the northeast. And it should do this with the communities that have been impacted by violent conflicts. Tarila Marclint Ebiede is a Ph.D. researcher at the Centre for Research on Peace and Development at the University of Leuven. You can reach him at marclint@gmail.com, or follow him on Twitter at @TEMarclint.